This short video about orchard practices at our farm at Kalangadoo was put together by The Primary Industries Education Foundation. This organisation encourages schools and teachers to educate students about the origins of food and fibre. Winter pruning starts as soon as the trees drop their leaves, and is hopefully finished by bud break in early September. Pruning generally consists of removing those branches that are more than one third of the diameter of the trunk at the point where they meet the trunk, and then totally removing strong, upright shoots from the remaining branches. Tree training involves pulling down upright branches coming from the trunk, and tying them with jute string so they are below the horizontal. This causes the tree to grow less vegetative shoots (i.e. less wood and leaves) and more fruit. 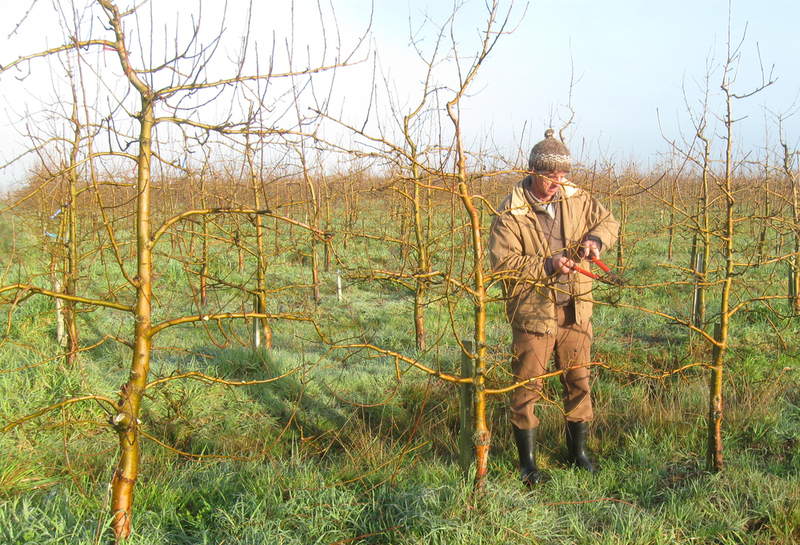 We generally aim for 10 to 12 branches per tree, with 10 to 12 evenly spaced apples on each branch - in other words about 100 to 150 apples per tree, or 15kg to 22kg per tree. With a tree spacing of 4 metres x 2 metres this is a yield of around 20 to 30 tonnes per hectare. While many "conventional" apple growers will brag about achieving yields as high as 60 or 70 or 80 tonnes/ha, the emphasis is on high volume and appearance - flavour, nutrient density or public health are not a priority. From November .... until we have finished! So what do you do for the rest of the year when picking is over? This is one of the most common questions people ask us, as the harvest draws to a close in late May. One of those jobs which is way bigger than picking, is "thinning". In fact for organic orchards which don't use chemical thinning sprays, it generally takes three or four times longer to thin a tree than it does to pick it. Thinning involves removing many young apples from the tree in spring or early summer, so the remaining apples are about one hand span apart. The flowers generally form in clusters of six. Following pollination, each of those flowers can potentially form an apple. Some flowers or young fruit may fall off by themselves - if they don't we remove the excess leaving a single apple from each cluster. See the cluster of six apples circled at left. Thinning involves taking off all the apples in each cluster except one. Looking at the picture to the right, a single apple remains in the cluster. Firstly to ensure the crop will have flowers next spring. If we don't thin by Christmas we might have a huge crop this year and nothing next year! Secondly, the taste and nutritional value of the apple will be better. A tree can only feed a limited number of apples. If you "over crop" it, the apples will not have such intense flavour. Thirdly, if two apples are touching there is a greater chance of getting insect damage. Often Light Brown Apple Moth grubs will feed where apples are touching as they are more hidden from birds. The main apple harvest starts in late February when the Gala mature, but we do have some very early varieties that mature from mid January onwards. The problem with the very early varieties is that because they ripen so quickly, they tend to go over-ripe (i.e. soft and floury) quickly. Some of them are delicious, but they must be kept in the fridge and eaten within a few days of picking. We generally harvest fruit from each variety two to four times, as the fruit on any given tree matures over a period of one to four weeks, depending on the variety. Fruit is picked into canvas bags that hold around 15kg, and emptied into bulk bins that hold around 400kg of fruit. It takes around four manhours to fill each bulk bin. Bulk bins are transported to the packing shed on the front of the tractor, where they are washed, brushed, graded and packed immediately and then delivered to local shops or the Farmers Market, as they must be sold to consumers within four days. 1. mating disruption, where pheromone dispensers are placed in the top of trees (1,000 dispensers per hectare) and the air is saturated with the scent of female Codling moth, so the males find it difficult to locate the females. 2. granulosis virus is a virus specific to Codling moth, and this is sprayed around egg hatch to kill the grubs before they can burrow to the centre of the apple. 3. Bt is a bacteria which infects only caterpillars (Codling moth, Light Brown Apple moth, Heliothis, Loopers, Painted Apple moth) and is also sprayed around egg hatch when the apples are small in November and December. Other insect pests have virtually disappeared since converting to organic practices 14 years ago. In the past (when things were "out of balance"), we did have problems with woolly aphid, weevils, apple dimpling bug, snails, etc. These pests are no longer an issue, and control measures are unnecessary. Perennial tussock-forming grasses (phalaris and cocksfoot) are our worst weeds by far. This really is a great district for phalaris, so we try a bit of everything - slashing between the rows, scything, undertree mowing, mulching, grubbing out tussocks with a mattock, introducing other species to provide competition, grazing with geese, ducks and chooks. We dislike phalaris and cocksfoot in particular, because they are so vigorous and competitive, and can really make a tree suffer if the grasses get out of control. Many of the roadsides around Kalangadoo have a dense sward of 100% phalaris 150cm to 180cm high, and absolutely no other species can establish without drastic human intervention. Black Spot (also known as apple scab) is a major problem in most apple growing districts. It is particularly problematic for organic apple growers, because we do not use the synthetic, systemic (i.e. absorbed into the sap of the tree) fungicides used by the majority of apple growers. We rely on copper sprays in September, and then wettable sulphur sprays later in spring. The main infection period for Black Spot is early September to late November. After this period, sprays for fungal diseases are not necessary. The other strategy we use is to grow those varieties that have (or can be encouraged to develop) a natural immunity to Black Spot. Other fungal problems that are experienced in many other orchards (eg. phytophthora, mildew) requiring the application of numerous synthetic fungicides are not a problem for us. We think it all gets back to a question of "balance". In a closed system, a healthy, biologically active soil is able to provide all the nutrients required by an orchard. However we have nutrients going out the farm gate in apples, apple juice, eggs and so on. So to maintain some sort of balance, we believe it is necessary to bring some nutrients back in through the farm gate. Since most nutrients find their way back to the sea (mostly from people in cities flushing the toilet), we think it makes sense to bring back nutrients from the sea, in the form of seaweed and fish extracts - so long as they can be harvested sustainably (which is a whole other can of worms!). So we use seaweed extracts and fish emulsion, and compost made from seaweed/local animal waste. We also buy in a small amount of local certified organic wheat, and when this passes through the intestines of a chook, it really does remarkable things to the fruit trees. We also have nutrients coming in from irrigating with our bore water, which contains more calcium than sodium, and a little bit of nitrogen. Nitrogen also enters the system from rain during thunderstorms, and from legume species fixing nitrogen from the atmosphere.